Solita Revisit – Fastest Moving Restaurant In Manchester? Last week my young son was sent home from school with an ear infection, he’s as mad about food as I am so I wanted to take him out to lunch to cheer him up. I couldn’t think of anywhere better than Solita, some of their dishes can put a smile on any face. We arrived to an eerily empty restaurant (particularly as my previous 2 visits have been a packed evening service and a street party) so I was slightly concerned as I’ve often found service & food quality lacking during very quite times in restaurnts, thankfully that wasn’t the case here. My son absooutely loves olives and as they were the only starter on the menu that I hadn’t tried yet they were an obvious choice. They’re actually called ‘Olives & Things’ on the menu, the other things being fresh capers. Both the olives & capers were fantastic, by far the best quality I’ve ever had in this country and probably as good as any I’ve ever had (and I ate a LOT of olives this summer in Portugal). The only slight disappointment was that in previous reviews/photos I’ve seen them dressed in parsley and chilli which I can only imagine would make them taste even better, whereas we had to settle for just a drizzle of nice olive oil. Being a good parent I felt I must introduce the boy to the joys of a ‘Pulled Pork Sundae’. I don’t often repeat order dishes as I love to try new things but I don’t think i’ll ever get bored of eating these. It was just as good as the two previous occasions and he very much enjoyed the little I could bear to part with. 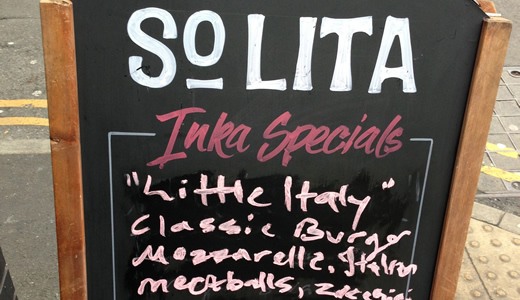 For main course I knew exactly what I wanted, a burger from the specials board called the ‘Little Italy’. 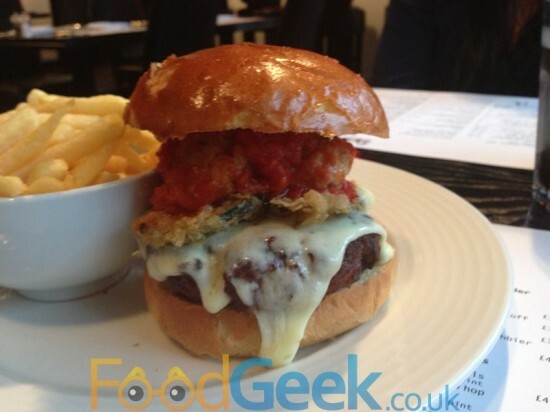 A classic burger topped with mozarella, Italian meatballs, zuccini (courgette) fritters and marinara sauce. That’s right, meatballs on a burger! Who wouldn’t love that? It was every bit as good as it sounded. Like my previous Solita burger I would have preferred the burger just a little less cooked but they do get away with it thanks to the added bone marrow keeping it super moist, other than that it was excellent. The mozarella perfectly melted and stringy, the zuccini fritters adding nice texture and crunch but it was really all about the meatballs and delicious rich marinara sauce which give it a gorgeous Italian vibe which could only have been improved with a little fresh basil. Mrs Food Geek was feeling healthy and so ordered the Portobello burger (Portobello mushroom, roasted Mediterranean veg, melted cheddar) but then gave in and added a topping of Smoked Brisket Chilli. 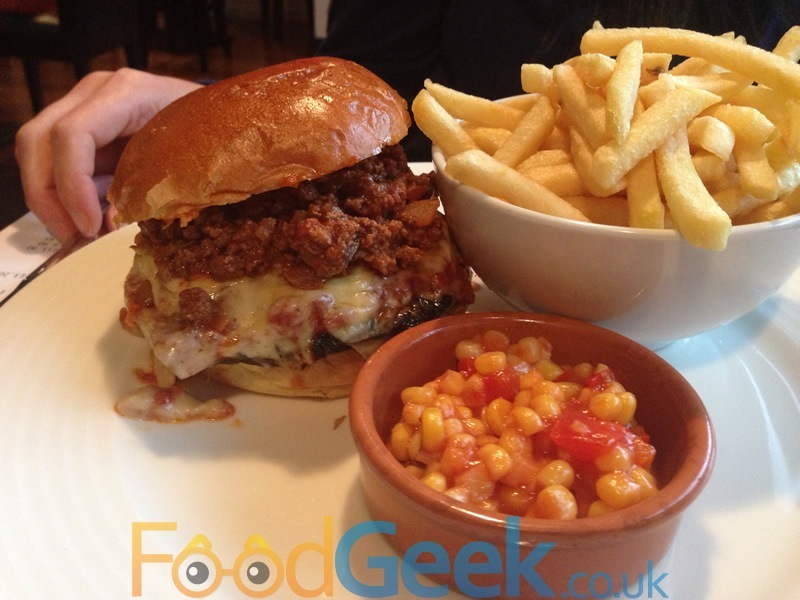 I can’t say how the Portobello burger would have tasted on it’s own but with the smoked brisket chilli on top it was great. It’s a very nice chilli (though needs a lot more heat for me personally) which we’d previously had topping the ‘All Beef, All Star Hot Dog’ and it worked brilliantly with the meaty & earthy mushroom and the other vegetables just about came through. The Childrens menu at Solita is fairly limited but includes the brilliant Pulled Pork Sundae as well as ‘Deep Fried Mac & Cheese Balls’ which we went for. I’d previously enjoyed these at ‘Solita In The Street’ and I just knew my son would love them and boy was I right! Despite not feeling great he demolished them in minutes, when I asked him for a quote for this review his response was “YUMMERS!” which is the highest culinary compliment. 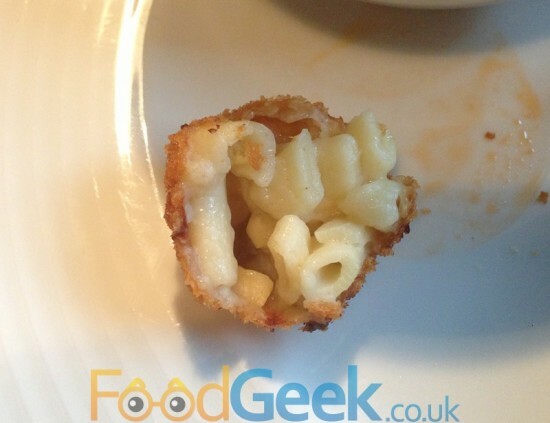 They are exactly as the name suggests, balls of delicious Macaroni cheese coated in breadcrumbs and deep fried! 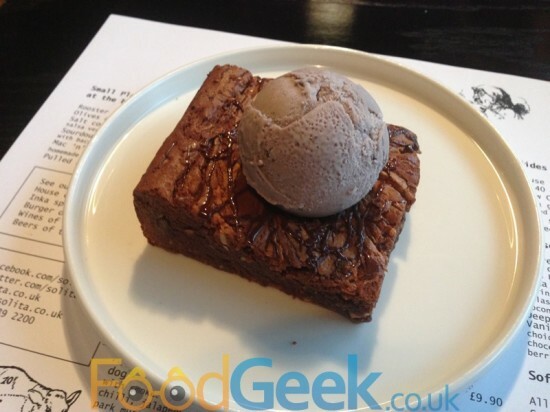 We were all very full by this point but there was no chance of me leaving without trying the special dessert I’d seen pictures of on Twitter for a few days – ‘Peanut Butter Chocolate Fudge Brownie with Oreo Ice Cream’. I’ve got to be honest, I don’t even like peanut butter that much but I just had to try it as it looked and sounded stunning. It tasted even better! The brownie was perfect, crunchy on the outside with a soft gooey centre and exactly the right amont of peanut butter, it comes through but it isn’t overpoweing. The Oreo ice cream was good quality and tasty but it was quite difficult to pick out the Oreo flavour, especially when eaten with the brownie, it was a little easier on it’s own though. With a few more Oreo’s in the ice cream mix this would be one of the best desserts ever, even as it was it’s right up there for me. Everybody else loved it too, an all round winning dessert! It was apparentley made by the wife of Franco (Dom’s brother), I’m sure there are many other reaons that he married her but I can confirm it was worth it on the stregth of this dessert alone! One of the reasons I wrote this review so soon after the last visit is because the best 2 dishes were both ‘Specials’ and that reflects something that I’ve noticed about Solita over the past few months, they just can’t stand still! The restaurant is barely 3 months old and was launced with a hugely creative and innovative menu with dishes including Pulled Pork Sundae, Deep Fried Mac & Cheese, Ice Cream with Bacon Candy and Deep Fried Coke. Yet they have been constantly tweaking and refining the menu the whole time, exciting new burgers have already been added to the menu such as the ‘Buttermilk Fried Chicken’ and there is even talk of a ‘Breaking Bad Burger’ based on the epic American TV show and containing amongst other things a blue corn fritter! Then there are the specials, as well as the 2 mentioned in this review I’m always reading on Twitter about one off specials such as last weeks venison or a special smoked sausage dish. It’s recently been announced that they are launching a compeltely new winter menu next week which promises ‘Solita goes south’, whatever that means we will have to wait and see but I’m sure it will be just as fascinating as the current menu. Oh, and there is also a special Thanksgiving Dinner (which I’m going to!) with an amazing sounding menu, a restaurant renervation/expansion (already), the launch of a takeaway menu and a charity cook book in the works! Basically they just don’t stop. Improving, innovating, expanding, however you want to describe it. 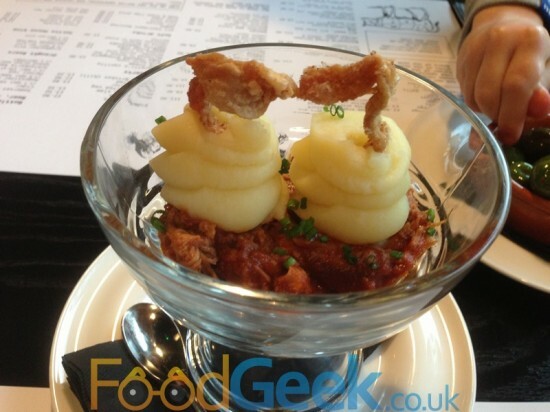 It’s just great to have a restaurant like that in Manchester and I’m enjoying trying to keep up with them. Previous: Invitation to Heston’s Sweetshop! How old is your son?? He sounds nearly as sophisticated as my godmother’s son who, aged 10, asked his dad “can we check out the new sushi place that’s just opened?” ! He’s was only 5 in July! He definitely had sophisticated tastes. He loves some of the more unusual tasting things like olives, grapefruit, Twiglets etc.. he’s a massive seafood lover too, loves fish, prawns (especially removing the heads & tails), mussels etc..
You can see him digging into the Olives behind the Pulled Pork Sundae! Hah, so you can! He’d have snaffled them all given the chance.